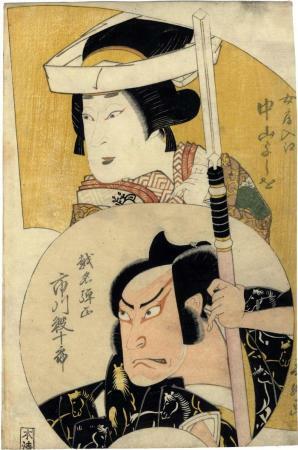 This print commemorates a performance of the play Honchō Nijūshi-kō (本朝廿四孝) or Tale of 24 Dutiful Sons. These figures appear in the Kikyo Field scene (Kikyōgahara - 桔梗原). Also, there are three other prints in the Lyon Collection based on elements of the Honchō Nijūshi-kō: #778, a diptych by Yoshitaki; and #s 1115 and 1116, both by Kuniyoshi. Notice the beautiful pattern of horses on the robe of Koshina Danjō.